Which Woolly Mammoth Model is This? The successful British television detective drama “Endeavour” has begun its fifth season and one of the episodes of this prequel to the long-running series “Morse”, featured a story involving a film company called “Mammoth Pictures Studios”, which had made a horror movie about an Egyptian Pharaoh and a curse. The emblem of the Studio, shown in the first few moments of the programme, which was entitled “Cartouche”, caught our eye, as it featured a model of a Woolly Mammoth (Mammuthus primigenius). The emblem of the fictional film company Mammoth Pictures Studios. Which Woolly Mammoth replica was this? The selection of the fictional film company’s name was no accident, “Endeavour” is produced by two organisations “Mammoth Screen” and “Masterpiece”, the choice of an iconic Pleistocene animal as the Studio’s logo was a clever pun on the name of one of the co-production companies. As the model revolved around on its simulated block of ice, we wondered how many model and figure collectors would have recognised the replica. It was tricky, the Woolly Mammoth was only on screen for a few seconds and it was shot from angle that gave the impression that the model was far larger than it actually was. When the camera is held low in relation to an object in shot and the viewer is given the impression of looking up at the object, then the object in question can look far more imposing and substantial than it actually is. The Woolly Mammoth figure from the television series. The clever use of photography made the identification task quite difficult. The model looks to have received a make-over in terms of its paint job, which also complicated recognition, after all, this is a detective television programme so working out the model was not going to be easy. 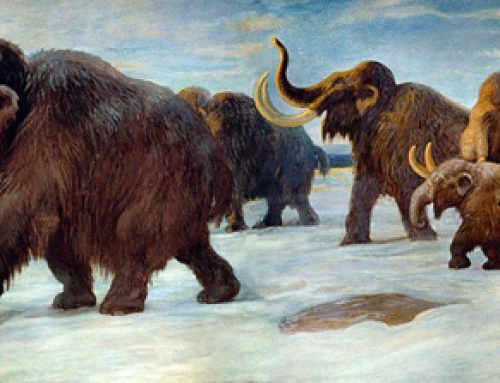 However, as the Mammoth rotated on its plinth it was suggested that this was a Carnegie Collectibles 1:30 scale Woolly Mammoth replica, one that had been retired and out of production. Is This the Woolly Mammoth from “Endeavour”? A model of a Woolly Mammoth. This Woolly Mammoth model was manufactured by Safari Ltd but was retired, along with the entire Carnegie Collectibles range in 2015. It is quite a rare figure, one that is difficult to obtain. Sadly, we at Everything Dinosaur sold out of this particular figure, some months ago. The Woolly Mammoth model seen on the television programme. At the very beginning of a detective drama, we had our own little mystery to solve. Have we detected correctly? Perhaps we need the observational skills and quick mind of the eponymous police office upon whom this television series is based.